Please don't send food I will not eat it, for my safety! 1. Ipad Mini -- My Ipad mini has stopped working, so I need another one for a better selfie pictures every morning and before going to bed. 3. Versace Bright Crystal -- I only have a few sprays, I can't get enough of it. I need another bottle. 4. 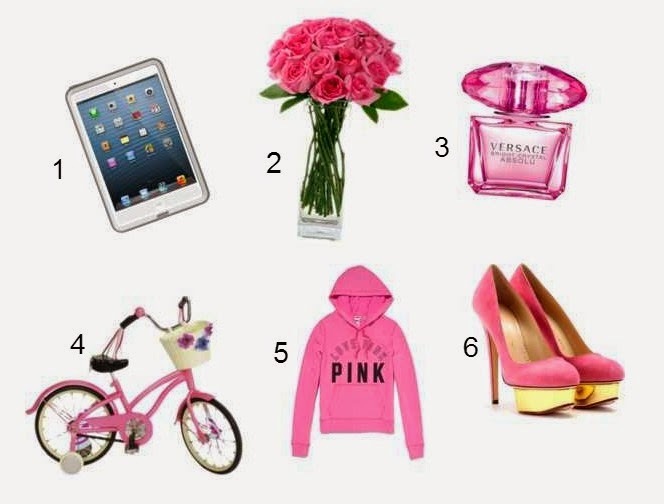 Pink Bicycle -- I don't know how to ride a bike but I need this for my photoshoot, with flowers in the front basket. Isn't that cute? Tee-hee. 5. Pink Sweater -- Rainy season is coming, i still need to look so fashionable even in the rain. I'm a medium in pullover or a large in sweatshirts. 6. Pink shoes -- I'm collecting shoes, so if you want to share or donate some for my collection, I consider your kind contribution. Oh, I'm size 7. By the way, I forgot to add that a Gift Certificate or Shopping Spree would be nice. Hahaha. If you plan on sending me something, send an email to me at (cutest_princess_06@yahoo.com) for my mail information. Happy Birthday! I hope you have a great day tomorrow.